Location: Truong Yen Commune, Hoa Lu District, Ninh Binh Province, 13km from Ninh Binh City. The mountains and sea combined to make Hoa Lu's picturesque landscape. Hoa Lu lays in a flat valley surrounded by the Trang An lime stone mountains, which form a natural wall protecting the old citadel. The city's northwest is bordered by the Hoang Long River, the tributaries of which run through the capital, cooling the weather within the city and serving as convenient waterways. When King Ly Thai To moved the capital from Hoa Lu to Thang Long (now Ha Noi) in 1010, two temples were built to dedicate to King Dinh Tien Hoang and his successor Le Dai Hanh. These two temples were first built in the 11th century and reconstructed in 1696. King Dinh Temple is located in Truong Yen Thuong Village, Hoa Lu District. It was built in the shape of a Han character. After the first entrance, called Ngo Mon, there is a royal stone bed with nghe (mythical animals of the old times) standing on both sides. Outside the temple, is Khai Thanh shrine dedicated to the parents of King Dinh. The temple is divided in three shrine: front shrine, thieu huong house, and sanctum, where the statue of Dinh Tien Hoang is located. On the left is the statue of his eldest son Dinh Lien. On the right are statues of Dinh Hang Lang and Dinh Toan. On each side of the altar, there is a stone dragon similar to the ones placed near royal beds. King Le Temple is situated in Truong Yen Ha Village, Hoa Lu District, 500m from King Dinh Temple. In terms of architectural design, King Le Temple is very similar to King Dinh Temple, but smaller. It also consists of three parts: front shrine, thieu huong house, and the sanctum in memory of the King. 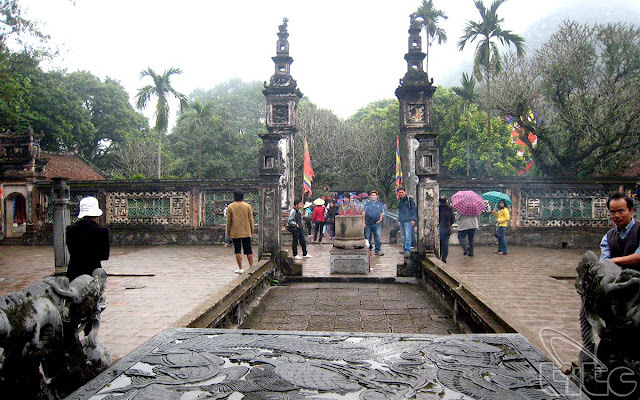 The statue of King Le Dai Hanh is at the centre, on the left is the statue of Queen Duong Van Nga facing the King Dinh Temple, and on the right is that of Le Ngoa Trieu, his fifth son and third king of the Pre-Le Dynasty. Coming to Hoa Lu visitors can attend traditional cultural festivals here, and the most important and largest of them is the Truong Yen Festival, which is held on the 10th day of the third lunar month. The festival is in memory of the Kings of the Dinh and Le dynasties. The festival lasts for three days with many traditional games and martial arts, reflecting local residents' legends.